From the floral pattern of the ‘Paradiso’ notebook to the new palette colours of Cult Gaia Ark Bag, these are the 10 things that we fell in love with — and have to have — this spring! 1. ban.do Paradiso notebook via Pop the Bubble: it’s perfect for meetings and to write down all your great ideas! This floral pattern is totally about spring vibes! We can’t get enough: notebooks, pencils, pouches, passport holders — we want everything! 2. #GalaConfidential book: Gala González is one of the most stylish influencers. Her style is eclectic, super cool and has a unique vibe. Now, she released a book about her 10 years in the industry as an influencer. 3. Anthropologie Ancer Chair: Spring means outdoor moments. This chair is perfect for a stylish balcony or terrace. Since the first time I saw it, I keep dream about long sunbaths reading a great book (like #GalaConfidential, perhaps!). 4. ban.do 'permanent vacation' tee via Pop the Bubble: everything in this t-shirt is perfect: from the colour to the cool sentence. How not to love the feeling of permanent vacation, even if it’s not entirely true? 5. 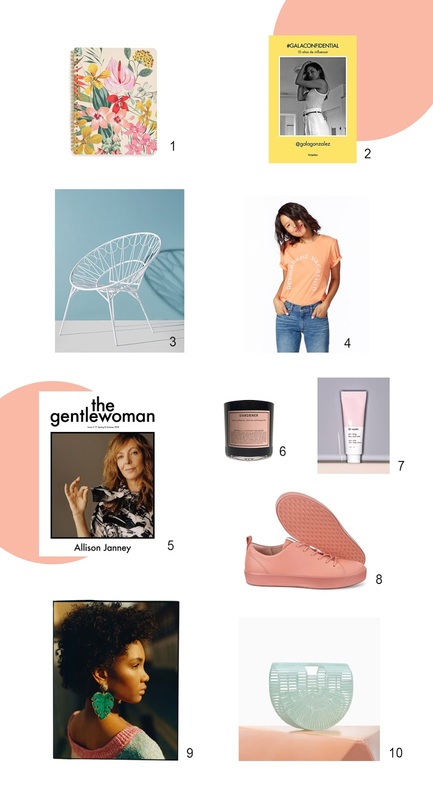 The Gentlewoman magazine: it's one of my favourite magazines and the spring & summer issue is here with the talented Allison Janney on the cover. 6. Boy Smells candle via Pop the Bubble: these candles are 'to die for', from the fragrance to the packaging, they're a must-have for your home. The Gardener is perfect to light up outside while sharing a glass of wine with someone special. 7. Glossier Priming Moisturizer: it has the perfect light texture for spring and, it's true, this moisturiser completely hydrates your skin. 8. ecco soft 8 ladies sneakers: as you know, sneakers are still a trend this spring — and I think it will last forever, who doesn’t want to combine comfort and style? And how gorgeous are these ones? The minimalist vibe, the quality of the materials and this colour are everything. 9. Uterqüe leaf earrings: statement earrings, that's right! Another trend that will be on top this spring. The vibe of these leaf earrings is amazing. 10. Cult Gaia Ark Bag - Mint: and this is it! Pastels are one of the strongest trends for the season — blazers, trousers, dresses, shoes and, of course, bags. Last year’s ‘it bag’ is now available in several shades of pastel: mint, pink and watermelon.